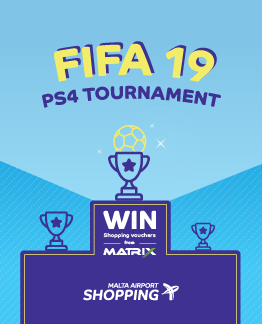 Kicking off on Sunday 14th October at 11am at the Airport Food Court, the event will focus its main attention on the new release of FIFA 19. The event will act as the first ever Maltese FIFA 19 tournament, just as last year's did for FIFA 18. The tournament will be handing out huge shopping vouchers to the top three finishes, with first place receiving €200, second €100 and third €50; all of which may be redeemed at Forestals Matrix, SkyParks Business Centre. The entry fee will only cost €10, although two separate vouchers, one of €5 for Matrix, SkyParks Business Centre and another one of €5 for the food court should altogether balance the equation. Yes, you heard that right, all who pay the entry fee will receive €10 worth of shopping vouchers - making it practically cost nothing! Tickets are available from the MIA Administration Offices on Level 2, which are open between 08.00 and 16.00 on weekdays and from the Gamers Lounge in Msida.